Okay, so Caitlin @Quills and Coffee tagged me for this EPIC tag and OMW I'm so excited! Thank you, Caitlin! I can never figure out how to answer this question :P I started "writing" when I was about eight, but didn't really get into it until four years ago. Or I guess you could say that I "wrote" my first book when I was six (in other words, I spoke it to my mom and forced her to write it xD), and I "finished' a novel when I was eleven (it was horrible. period). Buuuut that's why I can never answer this question in one sentence. Figure out why you're doing this. I know that sounds unusual, but why are you a writer? Why do you want to get published? When you get discouraged and aren't motivated, what is it that keeps you writing? The reason I was so drawn to writing was because I could serve God through it. If I hadn't nailed down my reason for writing from the start, I definitely wouldn't have made it this far. When I lose motivation or get frustrated, I always go back to WHY I'm doing this. That reignites my passion for writing and serving God. Get your goal in mind, and you'll go places. *flails* Exiles by Jaye L. Knight! I've been waiting f o r e v e r for it to come out! *laughs nervously* I'm probably not the best person to ask about that, because I usually find a way to see the unique qualities in every book. I think my best answer to this would be Cinder by Marissa Myer. I wasn't a huge fan of the book (sorry :P), but the idea of a cyborg princess was pretty unique. "They will be angry. You must be calm. They will ask questions. You must be honest. They will watch you. You must be confident." A Time to Speak by Nadine Brandes. It would be soooo epic. Or any of hers or Jaye L. Knight's novels. And basically anyone who wants to do it! What draws YOU to YA? What's (one) of your favorite quotes from YA lit? AUDREY!!! We both posted tags at the same day! This amuses me so much I don't know why haha. I did like Cinder's premise a lot! That quote is amazing too :) I should try a Nadine Brandes book soon. I'm in that stage too! I'm learning sooo much right now, and it's like, "I want to use ALL of it!" It was so fun reading your answers to these questions - and THAT QUOTE. A Time To Speak is so awesome <3. I adore when my younger sister and I read books together and then quote them to each other xD. Wonderful post, Audrey! OHHH this is great! I loved reading all of your answers to these questions! Ooooh did you get K. M. Weiland's book, or are you just following her blog? I feel like I might be similar to you in writing style. I currently plan the way you used to, but I feel like I might want to get a bit more in depth...if you got the book, is it good?? *glances down and sees your instagram feed* OHHHH YOU DID GET THE BOOKS! In that case, how many have you read? Which one is your favorite so far? Would you recommend buying them? What a fun post! So as this is your first time taking part in a tag what did you think? do you like them? I guess it's a blogger tag day :P My feed was full of them! YOU MUST TRY A TIME TO SPEAK. They're just amazing books, okay? And omw you're reading Blades of Acktar right now too?!? I'm on the second one right now and finding myself relating with Renna so much (you know, tripping over things and stuff. I do that sometimes xD). And Brandi's so sweet and I love characters with dark pasts like Leith's *stops fangirling* Who's your favorite character? I know! Even though I wasn't a huge fan of the book, I had to admit that the idea was very unique. AAHHH!!! I saw this tag and I was like, "Please Audrey tag me," AND YOU TAGGED ME!!! *hugs* Thank you, this looks so fun! =D AND THAT QUOTE!! It is one of my favorites too, and Jaye and Nadine are both AWESOME writers!! It's so fun reading your first tag and finding out more about you as a writer!! Yes, I am! I didn't know you were reading them, TOO! :D I just started the last book Deliver. (I can totally relate to tripping over things. I also like to walk into stuff, and sometimes people. :P) Oh, my favorite character? Leith, for sure! <3 How about you, who's your favorite? omw Leith is epic! He's definitely my favorite character, though I'm starting to like Renna a lot more now. I JUST started Defy, and I can't wait to read Deliver! *lowers voice* I've actually never had coffee before :P I've tried tea, but I just don't do drinks besides water when I'm writing for some reason. I had a feeling you'd like it. xD I can't wait for the post! That's so awesome! It's so beautiful when we find something that we love and that, no matter how many times we doubt, we're drawn back to, like He's giving us a little nudge saying, "go do that. I made you for it." Aaahhh thank you! It was super fun to do. Wow, a tag for YA authors! How cool! AAHHH THANK YOU IT WAS FUN TO WRITE. I honestly feel like the worst friend ever because I tagged you for this and didn't even realize you had done it!! *gasp in shame* I'm so sorry! But I love your answers, Audrey! I have a Time to die on my TBR, and I'm excited to read it. Nadine is so sweet =) Thank you for doing the tag, girlie! 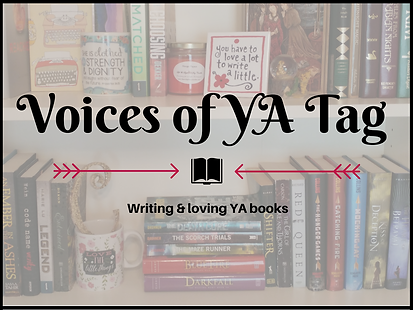 Sorry again this is so late, but I'm still sharing this post... Oh, and also, there's now a list on my blog of all the posts for the #VoicesofYA tag, if you want to meet some other YA writers!